Cirrus Logic's business could benefit nicely from Apple's upcoming iPhone product launch. 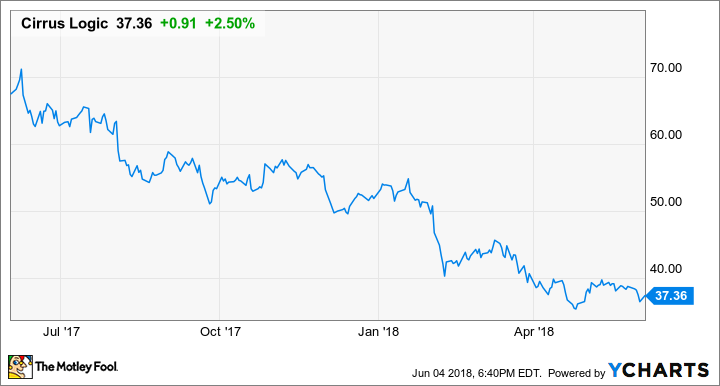 Audio chip specialist Cirrus Logic (NASDAQ:CRUS) has been a disappointing performer over the last year, as shares are down more than 45% during that time. Cirrus' business depends heavily on its sales of audio chips to Apple (NASDAQ:AAPL) for its iPhone and, to a lesser extent, iPad and Mac product lines. According to the company's last annual filing, 81% of the company's revenue came from sales to Apple during its fiscal year 2018. That figure was actually up from 79% during the company's prior fiscal year, and significantly up from 66% in fiscal year 2016. As sales of Apple's latest iPhones have disappointed, Cirrus' business and its stock performance have been affected. In February, Cirrus CEO Jason Rhode told investors that while its "design position with key customers remains strong, revenue was below expectations due to unanticipated weakness in smartphone demand that materialized in late December." In other words, that iPhone weakness that's been evident for quite some time took its toll on Cirrus Logic's performance. With that in mind, here's why I think the next iPhone product cycle -- which, if history is a guide, should begin in about three months -- could work in Cirrus Logic's favor rather than against it, as the current product cycle has. Ahead of Apple's iPhone product launch in September of 2017, analysts and investors alike were expecting the company's iPhone X to drive a so-called "super-cycle." In other words, they were expecting the redesigned phone to accelerate the pace at which current iPhone users upgraded their devices, driving a surge in iPhone unit demand for Apple that would, of course, benefit Apple's suppliers. That didn't happen. Instead, Apple reported a slight iPhone shipment decline during the first quarter of its current fiscal year and a slight iPhone shipment increase during the second quarter of that fiscal year. Right now, it's looking like iPhone unit shipments for this product cycle will come in roughly flat. Later this year, though, Apple is expected to release a successor to the current iPhone X, much more compelling products at lower price points to replace the iPhone 8 and iPhone 8 Plus, and even a jumbo-sized version of the upcoming iPhone X successor. In other words, Apple seems to be set to significantly strengthen its iPhone product lineup this year. That rejuvenated product portfolio could help Apple deliver year-over-year iPhone growth, which would be good for suppliers that depend heavily on Apple, like Cirrus Logic. On top of that, with Cirrus Logic stock down nearly 50%, and with the shares trading at a hair over 11 times trailing-twelve-month earnings, it looks like expectations are in the proverbial cellar. The combination of a potentially strong iPhone product cycle, low stock valuation valuation, and what appear to be generally low investor expectations, Cirrus Logic stock looks like a compelling risk/reward proposition at current levels. Where could the stock go? Right now, current analyst consensus calls for Cirrus Logic's revenue to drop 11% year over year during the current fiscal year, with earnings per share set to plunge from $4.27 to $2.96 (thanks, presumably, to the loss of leverage that would accompany such a revenue drop). This means the stock is trading at around 12.62 times this year's expected earnings per share -- that is, if you think the analysts have it right, here. That's not absurdly cheap, but a lot of pessimism is certainly priced in. Moreover, analysts expect Cirrus' revenue to grow by 5.4% in the coming year, with earnings per share set to rise to $3.25. Cirrus Logic trades at 11.5 times next year's expected earnings per share. I think if the coming iPhone product cycle proves more robust than the most recent one did (I don't think investors are expecting much in the way of iPhone unit shipment growth in the coming product cycle), there could be upside to current Cirrus Logic revenue and earnings per share estimates. On top of that, if investors can simply get confidence that Cirrus' revenue and profit decline are over -- at least for the foreseeable future -- the market might be willing to reward the stock with a higher multiple. Ultimately, if all goes well, I wouldn't be surprised to see this stock rise by a good 20% to 30% over the next year, and I think at this point, the downside is limited, because what could go wrong for Cirrus (e.g., a dud iPhone cycle from a unit shipment perspective) already has gone wrong.